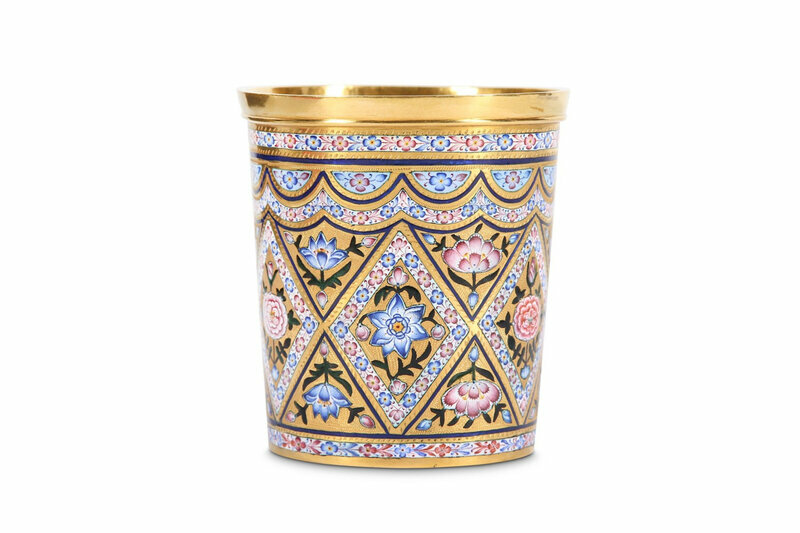 LONDON.- An ornate gold cup being offered in an auction of Islamic & Indian Art at Chiswick Auctions on October 26th, 2018 bears a remarkable inscription on its’ base: 'This cup was granted by His Imperial Majesty the heir to the throne (tsesarevitch) Alexander Nikolaevitch, October 1850'. The person mentioned is Alexander Nikolaevitch (or Nikolayevich) Romanov, Tsar Nicholas I's heir to the throne. He succeeded to the throne on his father's death in 1855 and was crowned Tsar Alexander II. He is remembered in Russia to this day as a great reformer and the promoter of the serfs' emancipation in 1861. Lot 170. A pink and blue enamelled cup, Caucasus or Russia, dated 1850, inscribed ‘This cup was granted by His Imperial Majesty the heir to the throne (tsesarevitch) Alexander Nikolaevitch, October 1850′. Estimate: £2,000-£3,000. © Chiswick Auctions. Of traditional cylindrical shape, on flat base inscribed in Old Slavonic script and with central coat of arms, with slightly splayed rim marked with a French import hallmark (owl), the body with painted light blue, pink, white, green and black enamels, the decoration on the exterior consisting of a register of diamond-shaped cartouches filled with pink carnations and stylised light blue irises within floral borders, next to them triangular cartouches with same flowers from a different angle within blue borders, the top with a festoon and half roundels of flower heads repeating same pattern below, 7.5cm high and 7cm diam, 152gr. 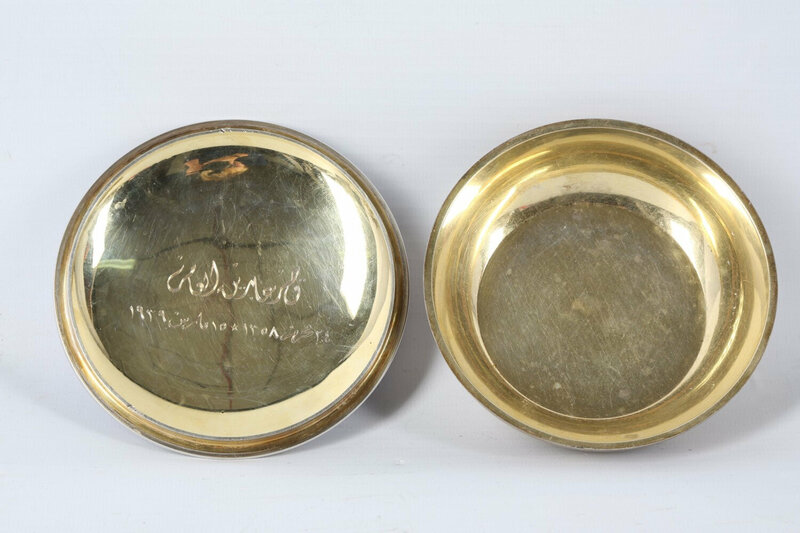 This cup is accompanied by the Assay Office London X-Ray Fluorescence Spectroscopy Certificate testifying that the inscription on the base measures 22 carat and all other parts above 23 carat. 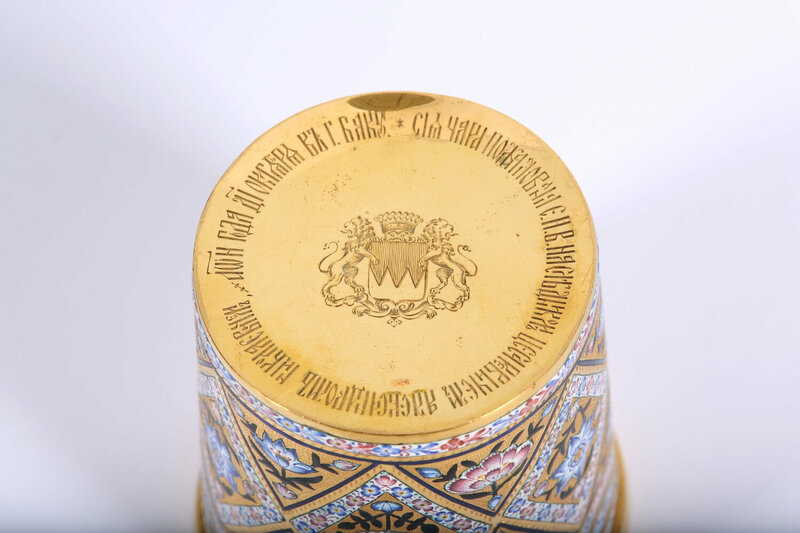 Inscription: ‘This cup was granted by His Imperial Majesty the heir to the throne (tsesarevitch) Alexander Nikolaevitch, October 1850′. 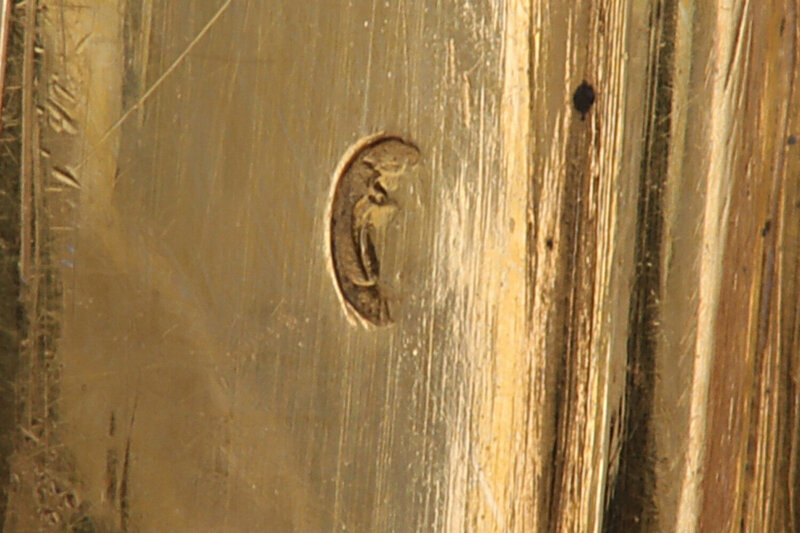 Alexander Nikolaevitch (or Nikolayevich) Romanov, the person mentioned in the Old Slavonic inscription on the base of our cup, was Tsar Nicholas I’s heir to the throne. He succeeded to the throne upon his father’s death in 1855, crowned as Tsar Alexander II, and he is remembered in Russia to this day as a great reformer and the promoter of the serfs’ emancipation in 1861. The young Alexander received a liberal education and differently from his predecessors, he was taken on a six-month tour of Russia in 1837, visiting 20 provinces in the country. His travels continued in the years to come, when he visited prominent Western European countries, Siberia, and Central Asian countries sharing borders with Russia (Edvard Radzinsky, Alexander II: the Last Great Tsar, 2005, pp. 63-69 and 190-200). Particularly meaningful are the records that report Alexander travelling to Georgia, Armenia and Baku in the months of September and October 1850, just before the breakout of the Crimean war in 1853. 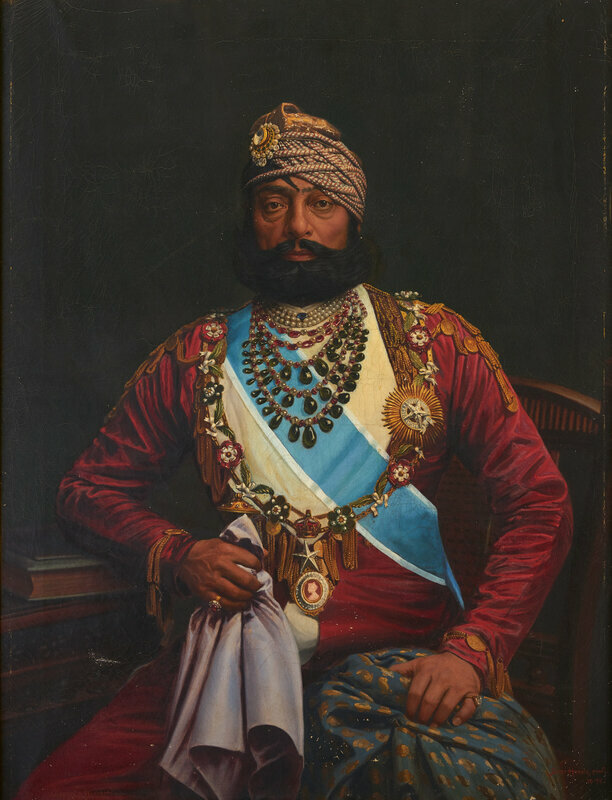 In Georgia, he met with the Qajar prince Bahman Mirza (1810 – 1884), the grandson of Fath ‘Ali Shah, vali of Azerbaijan and governor of Tabriz. He then went to Armenia, where in Yerevan he was greeted by Azis Khan, the local Qajar governor (Alexander Polovtsov, The Russian Biographical Dictionary, volume 1, Aaron – Alexander II, 1896, pp. 447-448). It is likely to believe that this cup was commissioned during one of these travels and that it may have been used as a diplomatic gift. The coat of arms in the centre of the base showcases per fess dancetty of three points argent and gules with supporters two lion rampants regardant, below a counts coronet. The central shield is reminiscent of the Franconian Rake, an heraldic ordinary with a simple zig-zag line of partition that divides the escutcheon or shield into red and silver fields. This simple and regionally widespread symbol was first officially recognised as the Franconian coat of arms in 1804, when Prince Elector Maximilian IV Joseph incorporated it into the Bavarian coat of arms. A special acknowledgement goes to Victoria Klyueva for her prompt assistance with the translation of the Old Slavonic inscription and biographical insights for this note. 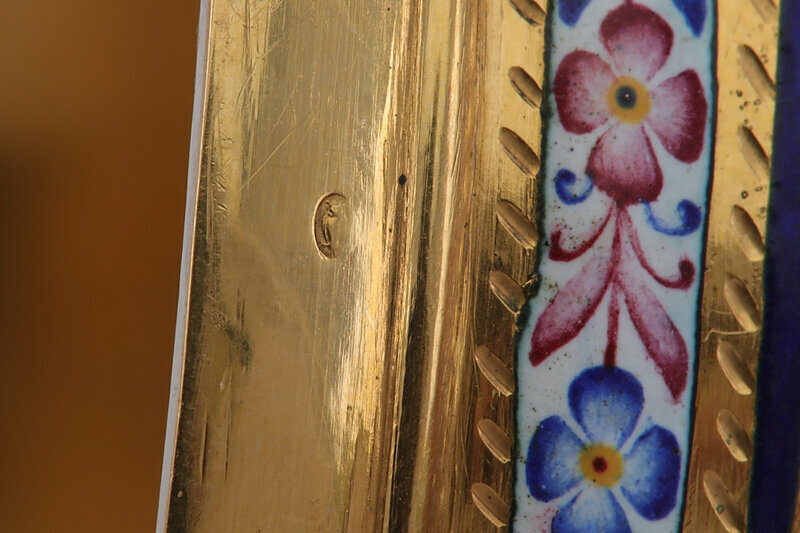 Also worthy of note in the sale is a small decorative blue enamelled and silver-gilt box commissioned to commemorate the Royal wedding of Mohammed Reza Pahlavi, the last Shah of Iran, and Princess Fawzia, daughter of King Farouk of Egypt. Lot 175. A blue enamelled silver-gilt royal box, Paris, France and Cairo, Egypt, dated 1939, commissioned to commemorate the Royal wedding of Mohammed Reza Pahlavi, the last Shah of Iran, and Princess Fawzia, daughter of King Farouk of Egypt. Estimate: £2,000-£3,000. © Chiswick Auctions. 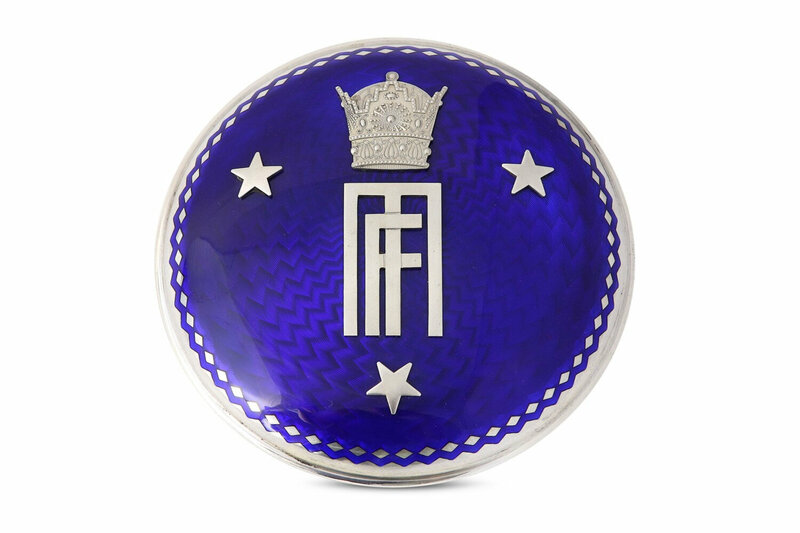 Of deep circular form, the body and lid silver-gilt, the domed lid decorated in guilloche beneath a blue enamel, a band of lozenges to the border, the centre with applied silver-gilt ‘F M’ monogram surmounted by a Pahlavi crown surrounded by three five-pointed stars, maker’s stamp Ah. 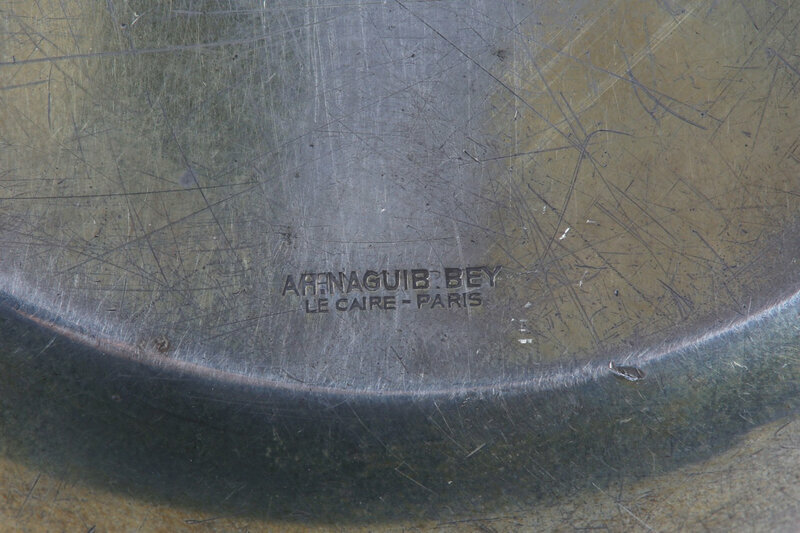 Naguib Bey Le Caire – Paris to base, engraved inscription on the interior of lid in ductus ornamentalis, 12cm diam. and 316gr. Provenance: Private noble family since at least the early 1980s. Inscription: Qasr Abedin Al Amer 24 Muharram 1358 – ‘The glorious Abedin Palace 15th March 1939’. This fine box was commissioned to commemorate the royal wedding of Mohammed Reza Pahlavi, the last Shah of Iran, and Princess Fawzia, daughter of King Farouk of Egypt. The wedding took place at the Abedin Palace in Cairo on 16th March 1939 and another ceremony was hosted at the Golestan Palace in Tehran on 25th April 1939. Princess Fawzia became an Iranian Princess (shahdokht) and national on 16th March. Several of these boxes had been commissioned to the fine Egyptian jeweller Naguib Bey from the royal family to be gifted to royals, nobles and important diplomats attending the wedding. 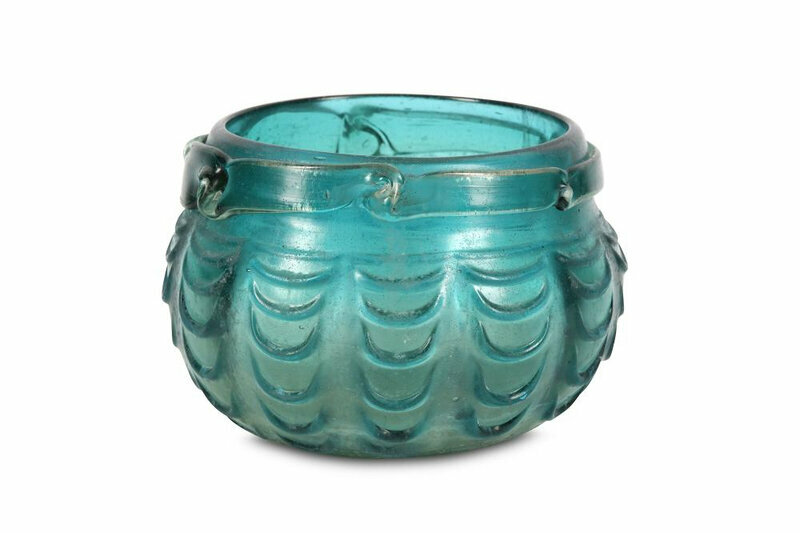 For identical boxes sold at auction before, please see Bonhams London, 25 October 2007, lot 236 and 24 April 2018, lot 254.